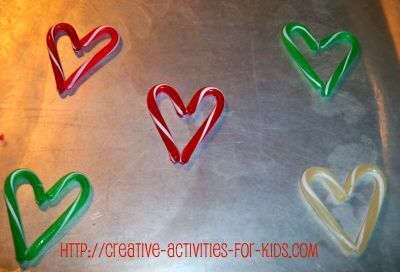 Use your leftover mini candy canes to make these adorable candy cane hearts. I would make these with my preschool class as a Valentine's Day treat for their parents and families. You can add a lollipop stick in the middle of each heart if desired. Then you can place them in cellophane bags and tie them with some ribbon or yarn. Place your waxed paper on the baking sheet, preheat your oven to 200 degrees. Place the mini candy canes so they are shaped like hearts and touching. See picture above for a visual. If you are adding lollipop sticks, you would place these in the bottom section. Place them in the oven until they become soft (5 minutes) remove and gently push them together so as they cool the stay attached. Once they are totally cool place the hearts in cellophane wrap or baggies and seal with a ribbon. Did you like making candy cane hearts? Try more holiday fun here!